Helping local athletes for over 50 years! Updated Tuesday September 26, 2017 by Kitchener Sports Association. 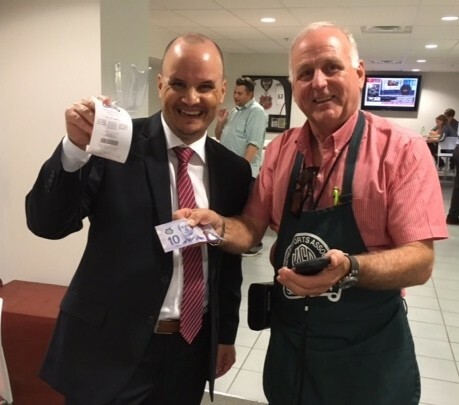 Photo: Mike Farwell was the first in line to purchase a 50/50 ticket under the new electronic system put in use for the Rangers 2017/18 season. Shown selling Mike the ticket is KSA's Rick Weinstein, one of the coordinators of KSA's 50/50 draw. The prize grew to $6,950 and was won by Bob Kline! Local minor sports groups appreciate everyone's support! "True Sportsmen Make Good Citizens"
Over the years the KSA has provided hundreds of thousands of dollars to local minor sports organizations and athletes for special projects such as equipment grants, travel assistance, etc. Most funding for these projects originates from the proceeds of the 50/50 draws at the home games of the Kitchener Rangers Hockey Club and, as of December 2016, also 50/50 draws at home games of the KW Titans (basketball). Money is also raised through bingo at the KW Gaming Centre (on Krug Street), KSA participation in Spin 12 events (in the past) and donations. Everyone is invited to attend the monthly meetings and network with other sports enthusiasts from the Kitchener community. There are no membership fees! We invite you to join us at our next dinner meeting, make a donation through our Legacy Fund, or contact us for more information about our programs.